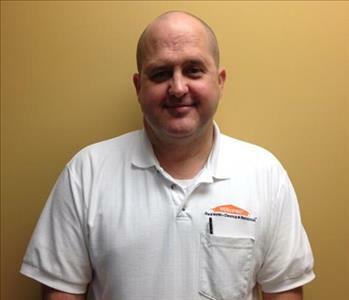 David, our Production Manager has been with SERVPRO for over 13 years. In 2002 David joined the company as a Production Crew Chief, then held the position of Sales Manager for several years before his current position. David is responsible for all insurance claim mediation between our customers and their insurance provider and specializes in mold remediation. David enjoys being able to advise our customers during a difficult situation by being an information resource for their restoration and insurance concerns. David is certified for work involving lead abatement by the Georgia Environmental Protection Division with the Lead-Based Paint Certification. David is also certified by CADSC Inc. as a Crime & Trauma Scene bio recovery Technician. Certifications held by David with The Institute of Inspection, Cleaning and Restoration Certification include: Water Damage Restoration, Applied Structural Drying, Applied Microbial Remediation and Fire and Smoke Restoration. Paul is our lead water restoration technician he joined our company in 2009. He is also very experienced in carpet and upholstery cleaning and has numerous repeat customers that request his services by name. Paul holds SERVPRO Crew Training, Water and Carpet & Upholstery Certifications. Paul is also certified for work involving lead abatement by the Georgia Environmental Protection Division with the Lead-Based Paint Certification. Certifications held by Paul with The Institute of Inspection, Cleaning and Restoration Certification include: Water Restoration, Carpet Cleaning and Applied Structural Drying. During his time off work Paul enjoys fishing and spending time with family. Matt joined SERVPRO as a Production Technician in 2016. Matt assists with water and fire damages, duct cleaning, and general cleaning. Matt states his favorite part of the job is watching the reaction from a highly satisfied customer. He enjoys putting a smile on customers’ faces. During his free time, Matt enjoys playing golf, racket ball, and spending time with family and friends. Lee joined SERVPRO of Athens in 2018 as a Production Technician. Lee's specialty is duct cleaning and mold remediation. He has taken advantage of SERVPRO's in house training. Lee enjoys spending time with his family and wood working. Joey joined SERVPRO in 2019 as a Production Technician. He is a certified Water Restoration Technician. Joey has also taken advantage of SERVPRO's in house training. In his free time he enjoys spending time with his 3 children, his wife, and playing the guitar. Connor joined SERVPRO of Athens in 2019 as a Production Technician. Connor has SERVPRO in house training and has experience in the restoration industry. Connor is newly married and enjoys spending time with his wife, skateboarding and playing the guitar. Shelley, is SERVPRO’s Sales and Marketing Manager. She started at SERVPRO in 2015 and she has taken advantage of the SERVPRO training to gain the IICRC Water Restoration certification. Creating the Emergency Plans for homeowners and businesses is a personally fulfilling job, knowing that she helps our customers be prepared for any size disaster. During her time off, she enjoys cooking, trying new recipes, gardening and spending time with her kids. Linda is our part time bookkeeper with over 15 years in accounting. She has worked for the Georgia chapter of 4-H for 27 years. Here at SERVPRO she enjoys having co-workers who work as a team and do an excellent job in what they are trained to do. In her spare time she enjoys gardening, scrapbooking and spending time with family and friends. Melissa, is the Receptionist/Dispatcher with SERVPRO. Melissa joined SERVPRO in 2016. Melissa has taken advantage of the in-house training. Melissa holds a Bachelor’s Degree of Science in Business Administration. The most enjoyable part of her job is the opportunity to help others. Melissa enjoys spending her free time with family as well as reading and scrapbooking.